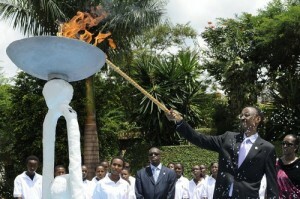 April 7 is the Day of Remembrance to honor the victims of the Rwanda Genocide, which started 20 years ago. As part of the process of healing the wounds of genocide, at the commemoration in Dakar, Senegal, the following poem by Kim Claire was sung by Kim and her friends. A silver beech without her crown. A pine with limbs lost and bright fresh wounds. A mighty oak’s snapped trunk.